The smallest princess also known as the queen of PLAY-DOH in the house, since she is not going to share her PLAY-DOH thingy with others and her capability to mix the dough in the most quickest time, my Miss Z has been slept early last night. 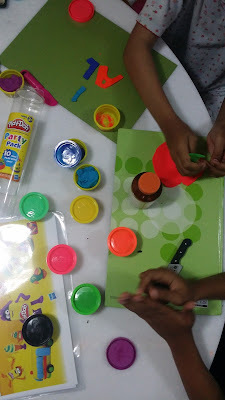 So it became the precious time for the big bro, Mr A, and the big sis, Miss E, to officiate the Party pack of PLAY-DOH that I have received a few days back. The pack come as part of the first-ever PLAY-DOH month in Malaysia. The challenge given was to "Shape a Colourful Community" by creating PLAY-DOH sculpture to reflect the meaning of Malaysia and/or its colorful community to us. I let both of them to plan, to divide the task and do it together. In a way, I am forcing them to cooperate, do proper planning and visualize their end result while planning. Hahaha tetiba rasa anak2 dah besar sangat when they can do all that smoothly without any arguments or extra 'drama'.